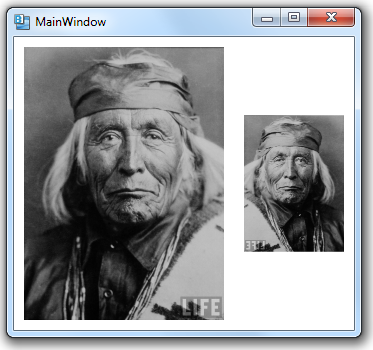 You can flip any image or control, creating a mirror image, by using a 2D scaling transformation. A scaling transform is represented by an instance of the ScaleTransform class. You use it to scale the visual representation of any image or control in the X or Y dimension (or both). The ScaleX and ScaleY properties of the ScaleTransform represent the scaling factors in either dimension. These values are normally positive, but we can use values less than zero to indicate that we also want the object flipped in the corresponding dimension. In the example below, we scale an image to half (50%) its original size, and flip it in the X dimension.